Eschscholzia californica, painting the west coast golden! California’s state flower was the first to be named in the Eschscholzia genus and was given that name by Adelbert von Chamisso, a German botanist, in the mid 1810s after finding it in San Francisco while on a scientific expedition aboard Rurik, a Russion ship. He named it after his friend Johann Friedrich von Eschscholtz, a Baltic botanist, who was also on the expedition. But of course Native Americans used this plant long before any visitors came exploring. They used every part of the plant, for medicine and food. There are so many reasons why this flower holds so much power. 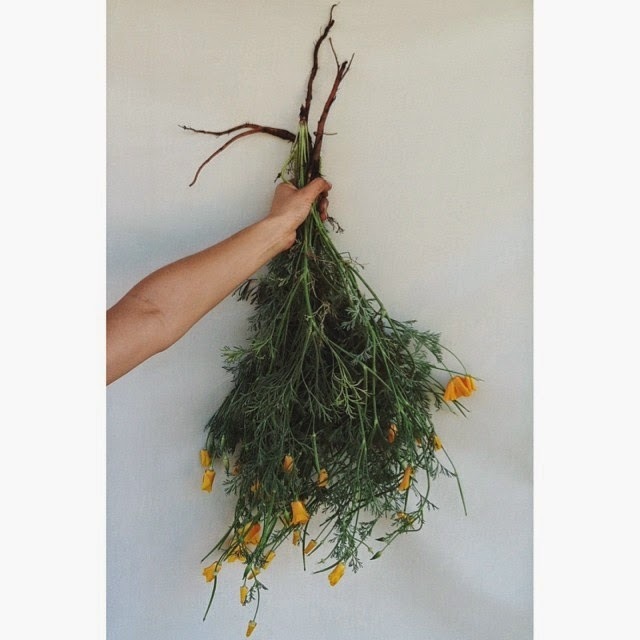 From healing properties to ecosystem health, it’s a great plant to have in any California or Southwestern garden. After spreading CA poppy seeds in our yard years ago from a wildflower mix they proved to be the most resilient variety and have kept coming back year after year with larger populations. Fresh CA poppy harvest from our home garden. They are one of the best plants to scatter over sheet mulch to get your landscaping canvass to the next phase. It’s best to scatter seeds before a long rain to get them well established. They will grow in slightly compacted and well-drained soil as well as sun and shade. I’ve found that the roots help aerate compacted soil. She is happier in the sun and well-drained soil though. If you let them go to seed, year after year, you’re seed bank will grow and you’ll have more and more poppies growing in your yard. They require no watering once established. One of her characteristics that I love so much is coolness. I’ve been known to lie down amongst them to feel and enjoy their cool, peaceful and moistening environment. Sometimes that’s all you need to receive the healing qualities of plants, simply spend some time with them. 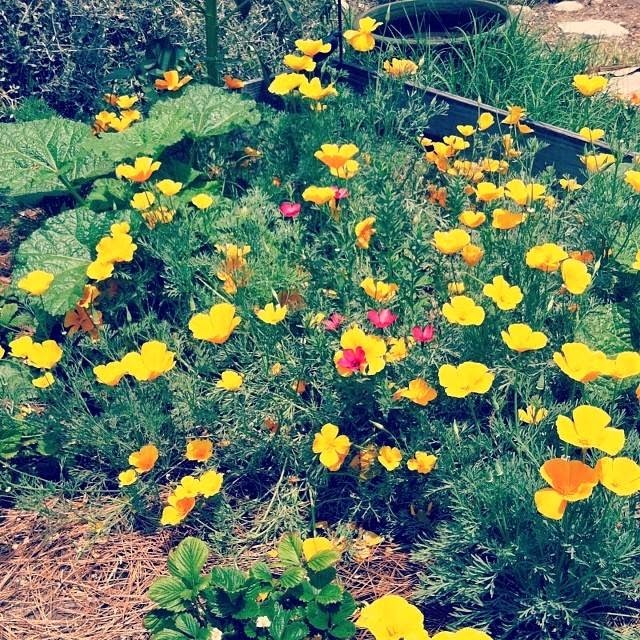 Speaking of healing, this past year, I intentionally grew CA poppies to tincture. I scattered seeds within one of our garden beds, which has richer and more well drained soil so the poppy’s roots could get nice and big and I tended to them by watering a bit more than usual. 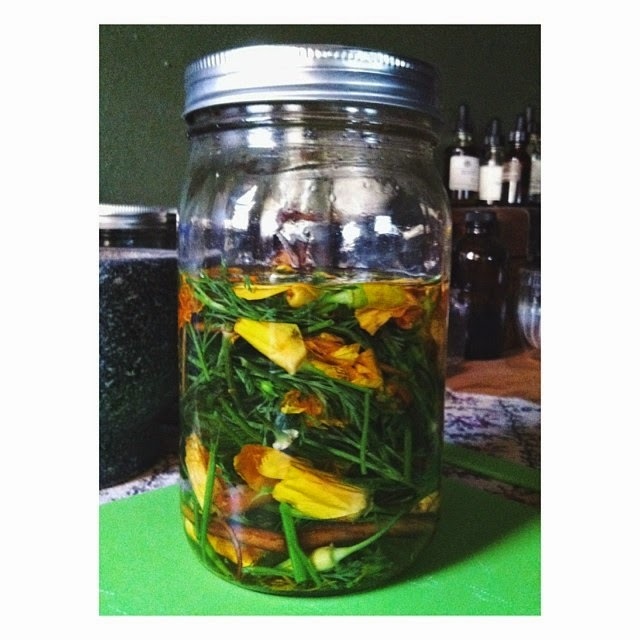 Poppy roots, leaves, buds and flowers in high-proof vodka. CA poppy is a relaxant nervine and antispasmodic amongst other things. The tincture has helped me with many sleepless nights from quieting a busy mind, aiding in acute nerve pain, and dulling PMS cramps. It doesn’t ‘knock me out’ but after I take 2-3 droppers full, about an hour before bedtime, once I finally fall asleep, my sleep will be undisturbed and quite comfy. I never wake up drowsy from it, which is the first question I always get. I’ve found it acts as a great bitter too stimulating the digestive system. I really like it cause it’s a rather gentle medicine that is even safe to use with children. 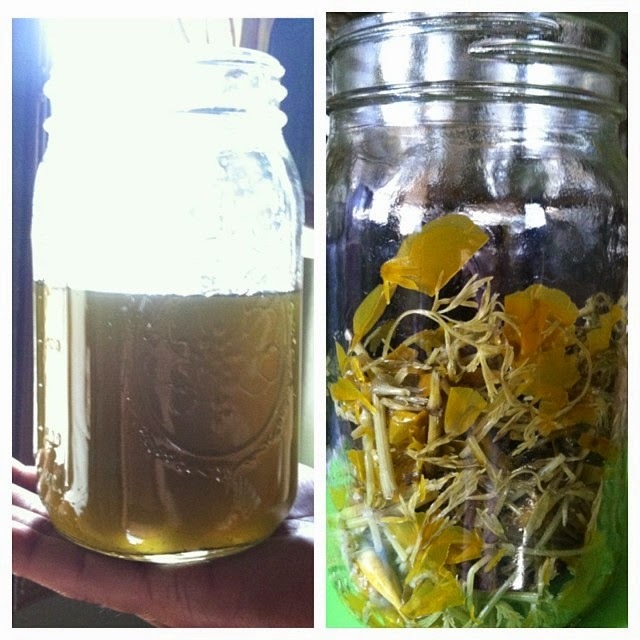 CA Poppy tincture on left and macerated poppies on right. This was after about 3 weeks. You can purchase CA poppies from Native Seed Search, here. Or wait till Spring when I’ll have some for trade or sale. If interested, please fill out my contact form on my About Me page and I’ll put you on my poppy seed wishlist. Here's a video that shows you how to harvest CA poppies with some great educational commentary courtesy of Herb Mentor.